Swan Lake Ballet co-produced by Navrasa Duende and Royal Russian Ballet Original Choreography by Marius Petipa and Lev Ivanov, renewed by Konstantine Sergeev in 1950. Music Score Mariinsky Theater conducted by Valeri Gergiev. 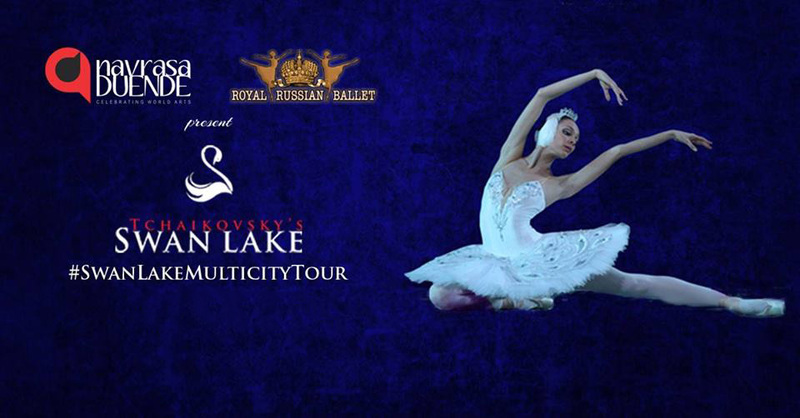 Swan Lake is the most beloved and quintessential classical ballet. It is a timeless story of good versus evil. From the first yearning bars of Tchaikovsky’s score, it beckons you to another world, with its bewitched swan queen, doomed prince, glittering villainess and drifts of white tutus. Beautifully crafted and sensually romantic, it is simply stunning. Adored by audiences for over a hundred years, Swan Lake is the most famous ballet in the world.The sublime transcendence of choreography that has been passed down generations after generations is unmatched, and the music of Tchaikovsky is never more attuned to the struggles of the heart than in this poignant work. The twinned role of the radiant white swan and the scheming, duplicitous black swan tests the full range of a ballerinas powers. A truly international troupe of dancers will create mesmerizingly elegant swans. Peter Ilyich Tchaikovsky (1840-1893) was the leading exponent of 19th Century Romanticism in its characteristically Russian mold, which owed as much to the French, Italian, and German traditions. Any attempt to proclaim a single masterpiece of any genre of music as the greatest or the most influential, or even the most enjoyable is generally meaningless. Yet when it comes to ballet music, all three superlatives tend to coalesce around one work above all others – Peter Ilyich Tchaikovsky’s Swan Lake. The practice of the time was for a composer to closely tailor a ballet score to a detailed scenario. In this instance, he had little direct guidance from the authors and was left largely to his imagination. As a result, the music was structured in broad gestures and treated rather in the manner of a symphony. Tchaikovsky’s innovations were too complex and ahead of times to find initial acceptance and success. It took a lot of understanding over the years to appreciate the complex musical composition and choreograph dance sequences accordingly. The music went much beyond mere accompaniment and support and has immense melodic and psychological depths. The symphonic craft that Tchaikovsky brought to the theatre was as revitalizing as the touch of theatre that he brought to symphony writing. Indeed, the foremost quality most often attributed to the Swan Lake score is its symphonic nature, an innovation for the genre. His music score captures the full range of human emotions: from hope to despair, from terror to tenderness, from melancholy to ecstasy. The moods extend from the exquisitely tender violin solo of the Swan Dance Andante to the thundering explosions of the finale, with an abundance of vividly variegated numbers in between. By treating ballet as a subject worthy of musical imagination, Tchaikovsky not only created an enduring masterwork but also set a new standard for the role of music in ballet. Navrasa Duende is a new venture in the realm of arts and entertainment. The organization has its roots in its founder’s strong belief in promoting performing arts of all genres, including modern, traditional, and popular works from India and around the world. The company endeavours to create, manage, and promote unique productions of live entertainment across countries in a wholesome manner, comprising music, dance, theatre, cinematic arts, visual arts, fashion, literature, wellness, and architecture. The quest to explore diverse cultures and art forms, introduce them to global audiences, and create an impact on the lives of people is at the core of Navrasa Duendes goals. The organization also aims to discover and promote young talent from the far-reaching corners of the globe and to provide them with a platform to showcase their artistic flair. Through collaborations with esteemed artists and veteran performers, Navrasa Duende looks forward to fostering an environment of thriving creativity. Royal Russian Ballet theatre was founded in 2008 in Ukraine in order to save and promote the best traditions of Russian classical ballet around the world. Classical ballet is the main priority of the theatre – staging and presenting the most famous classical performances of world heritage. The ballet troupe includes 55 best ballet dancers from Russia, Ukraine, and Europe. They are graduates of the famous ballet schools of Moscow, Perm, Voronezh, Kiev, Kharkov, Minsk and Chisinau. In many success tours, their art has been appreciated by viewers in more than 20 countries, including USA and Canada, Colombia, Ecuador, Chile, Bolivia, Peru, Honduras, Salvador, Costa-Rica, Venezuela, Guatemala, Spain, Portugal, Poland, Czech Republic, Slovakia, Hungary, China and, of course, Russia and Ukraine.